It was at that seminar that I met Dr. Nick Nicholson, my surgeon. I remember sitting in the seminar, listening to him tell the group about the various surgeries available, the pros and cons of each one, and how each one helped you to lose weight. What I really liked about his approach was that it was not a sales pitch. He was very passionate about what he did to help people every day, and really impressed upon the group that he believed that he helped people get healthy through WLS. I remember we talked with him for a little bit afterward–it was late, and he’d been in surgery all day and was ready to go home to his family. I told him I was a biology teacher, and he told us that he’d come from a family of educators. After we thanked him for teaching us more about WLS options, we went home to mull over and process all the information we’d just been given. I made my decision midway through the presentation that Dr. Nicholson was who I wanted to perform my surgery. The next day, I called his office to get the ball rolling, and the rest is history. So 2 more consults and 6 months later, he and I had a date on a surgical table. And you all know how that’s turned out so far. January 22, 2013 will be a date that is forever impressed upon my memory because it is the day I chose the person who would help me reclaim my health. It is the day I chose the person who would create a powerful tool that I have used to level the playing field in terms of being able to lose weight. It is the day I began the countdown to a healthier me. It is hard to believe that I am over 140 pounds lighter than I was a year ago. It is even harder to believe that I am 180 pounds lighter than my heaviest weight ever. I still have a long way to go. 90 pounds more. And to me, that’s still so much. Yet it is less than I’ve ever had to lose, and less than I have already lost. But I will fight for every pound until I get to my goal. I’m not far from Dr. Nicholson’s goal, and I aim to either hit it or get real damn close by the time I have to go back to him in April. I know what I have to do and I plan to work like hell to get there. Today, all my meals were eaten away from home. I decided I wanted beans for breakfast, so I stopped and got a breakfast bowl with turkey, beans and eggs at Rudy’s. I have leftovers for tomorrow since I only ate half of what I got. I had to attend not one, but two Rotary meetings today (one at noon, and then my own club’s meeting tonight) so I ate lunch at the Marriott, and dinner at the place where my club meets. Lunch looks bigger than it actually is…I ate all my salad (which was not a lot; it just looks like it is), a bite of carrot, a few bites of potato, a little bit of the roll (it was whole wheat) and all my chicken. At dinner, I had the waitress box half the plate for me so what I was brought was actually half of the regular sized meal. I didn’t eat all of the veggies, but I did eat all the meat. Today’s protein was 82 grams, carbs 54, fat 42, calories 991 (damn carbs). I drank 112 ounces of water and walked over 3 miles today. My period started today, grrr…my carbs have been high the past two days, but I think the next day or two I’m going to scale back. Friday night I’m planning on lifting weights, and Saturday I’ll ride the bike. I haven’t decided what I’ll do Sunday, but I think Monday I’ll lift weights again. 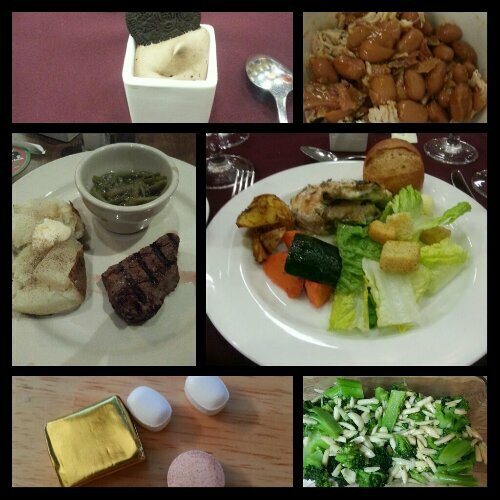 Today’s food choices, from upper right: turkey, egg and bean breakfast bowl from Rudy’s; chicken breast in bechamel sauce, romaine salad with croutons, seasoned vegetables and whole wheat roll; broccoli almond salad with citrus dressing; multivitamin and calcium supplements x2, iron supplement; sirloin steak, green beans and part of a baked potato; chocolate mousse with an Oreo (didn’t eat the Oreo). Yesterday, I was a protein beast. I got in 102 grams of protein, 53 carbs and 44 fat. Calories were 971, and I got in 112 ounces of water as well. 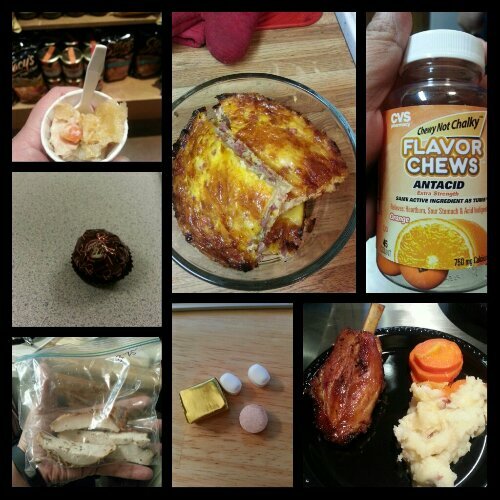 Today’s food choices, from upper right: CVS chewy antacids; sticky pork wing, glazed carrots and mashed potatoes; multivitamin and calcium supplements x2, iron supplement; roasted turkey breast meat; Ferrero Rocher dark chocolate ball; sample of chicken pot pie; ham, egg and cheese casserole. Not shown: spicy taco beef stew meat and 1/4 dinner roll. This entry was posted in being thankful, daily bites, eating, la guerra, post-op, reflections, the sleeve, vsg, weight loss surgery, what's up doc? and tagged being thankful, daily bites, dining out, dr. nicholson, eating, exercise, la guerra, Nick Nicholson, omg I eat carbs!, post-op eating, post-op life, reflections, sleeve gastrectomy, stupid hormones, VSG, vsg realness, what's up doc?, WLS, workin' on my fitness. Bookmark the permalink. I really like your approach to managing your sleeve…IMHO it’s the most realistic one I’ve seen so far. I get a lot of inspiration from you!